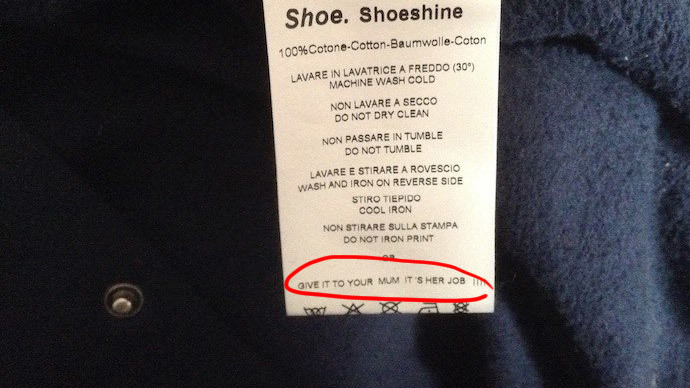 An Italian politician has blasted clothing brand Shoeshine’s washing instructions as being offensive. Mazzoni accused the brand on Twitter of ingraining played-out gender stereotypes. She believes such words are offensive for both women, who are treated as nothing but housekeepers, and men, who seem to be incapable of doing such simple things as washing. Mazzoni also complained to the IAP, Italy’s advertising standards authority. According to an online daily Tgcom24, the brand’s distributor Unipersonale said it was merely a joke aimed at teenagers, who are the company’s target market, and no sexism was intended. Mazzoni’s outburst gained wide support among social media users. Some even called for a boycott of the brand and accused women’s rights defenders of turning blind eye to such cases. Opposing critics say there is nothing wrong in appealing to one’s mother, simply because she knows better. @MazzoniFede quando ho bisogno di consiglio su lavatrice lo chiedo a mia madre ma ciò non significa sminuire il suo lavoro. Sono sessista? During the last few years many retailers have come under fire for controversial clothing texts. READ MORE: Just the job for women? A year earlier, Topman was accused of legitimizing domestic violence by printing lists of excuses for it on T-shirts, such as ‘I was drunk’ and ‘You provoked me’. The company apologized and withdrew the clothes from stores. LA-based retailer Forever 21 had to get rid of their women’s T-shirts with slogan ‘Allergic to Algebra’. JC Penney was also forced to give up in an ethical dispute over a slogan on a teenage-targeted sweatshirt saying ‘I'm too pretty to do homework, so my brother has to do it for me’. Wearers of controversial clothes sometimes have to explain themselves as well. Last year a British scientist Dr. Matt Taylor, who helped landing the European Space Agency’s Philae lander on a comet over 400 million km from Earth, faced a storm of critics for wearing a shirt with pin-up girls bearing firearms. Sexism is not the only ethical problem retailers have been accused of recently. A year ago, clothing maker Zara came under fire over pajamas with a six-point star which resembled the notorious yellow badge Jews were forced to wear under Hitler’s Nazi regime.